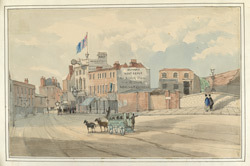 A view of Deptford Bridge, from c.1841. A sign on the bridge marks the boundary of the parishes of St Paul's and Greenwich. Davis Jr. grocery, Joseph Hoare cheesemongers and James Oliver's shoe shop are among the many trades depicted in the background along Deptford Bridge. The Nelson coach calling at Woolwich and Greenwich is depicted in the foreground.